Why do we buy three group-head machines? Something I noticed in shops lately got me thinking. There seems to be a fundamental paradox in artisan coffee when it comes to utilizing espresso machines. We all want to produce a quality product and that takes skill, timing, knowledge, and the proper equipment. Most shops assign one barista to a machine, allowing that person full control over the work space and the needed spacial/time freedom to meet demanding standards. For me, it is a sacred space and I enjoy feeling like it is my special little work station. These same high end shops use Stradas, Lineas, and Cyncras that generally have 3 group heads (in the case of some older machines, sometimes more). But there is a physical limit to how fast a barista can work and balance skill and speed; ideally, we want to dose and tamp a shot, steam milk, and have them both finish simultaneously so every element of the process is at it’s peak. In that time and space, we realistically only utilize one group head and steam wand. So then why do we have more than one or two group heads on our top of the line machines? Given, on a busy day, I can follow these steps and use more than one set of components; while I am letting the first shot pull, I can dose out a second and start it as the first one finishes. Though this may not be ideal for perfection, it does allow for efficiency. If I have a second barista on hand, they can start the milk for the first shot as I dose the second, thus using both sides of the machine at once. 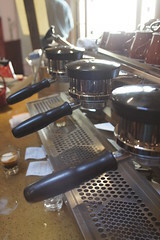 However, in practice, the addition of a third grouphead seems beyond me since it seems that no one in high end coffee puts more than one barista to a station. The paradox: it is beyond physical limits to utilize the entire machine without violating the “culinary rules” of espresso and degrading the quality we all have sworn upon to passionately produce. We ideally want to have the master barista in total control of their environment, allow them the freedom work within that “sacred space” and produce high quality drinks that must exceed extremely high standards. Making one individual pull multiple shots detracts from this standard, and it would be impossible to use both steam wands at once (unless you are like me and in a rush, I will admittedly put drinks like chai on one side, let it steam independently, and work the other side of the machine for my espresso, but I really do not recommend this dire tactic). This is, however, a very “romantic, third-wave” view of the barista as an artist. There is another portrait that deserves just as much recognition; the team working fluidly as a well oiled machine. When one sees a pair of highly trained baristas, each with an assigned task working seemlessly like clockwork, one has to admire the precision and discipline of the barista as a craftsman and less of an artist. While I think this hearkens back to an older generation of coffee (one that we seem to be moving away from with such a saturated market), Sam is right to say that a group of baristas utilizing a 3-head machine in its entirely is also somethign to admire. Where does the balanace come from? Why do we need bigger machines? For me, it just seems cumbersome and even a bit unnecessary to have such a large machine to work around. There are a few reasons I could think of for using machine’s with multiple group heads. 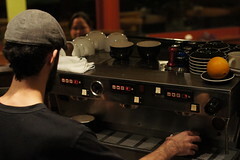 Baristas all know how much stress we put on our equipment on a daily basis. I always rotate between the three group heads between banks to keep the wear of the individual group heads to a minimum. So, having multiple heads make sense since it feasibly extends the life of the machine. But then again, if you are like me, I will absently mindedly go to the grouphead closest to the steamwands whenever I am in a rush, thus defeating this process entirely. Having multiple heads requires a big boiler and a lot of water. Thus, a bigger boiler would likely give the machine as a whole more stability and the ability to maintain constant pressure and temperature more easily. Since keeping things consistent is essential when we are constantly removing the group heads and backwashing the pump, having a good distribution of pressure and temperature between various points on the machine is another reason for three or more heads. As my friend Andrew told me, and he is more than right on this one, having the extra group head is nice as a back up. We have had instances in the shop where one of the heads was not properly flushed the night before and the build up on the pumps puts one of the heads out of commission for a bit. Having an extra head saves you the headache and worry of “dangerous” situations. In the past when coffee was treated more like a manufacturing process then a culinary art, putting more than one barista on the bar and having multiple people work on one machine made a lot of sense; efficent use of as many workers as possiblemaking drinks as fast as possible. 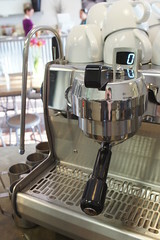 I was online looking at machine’s the other day and saw a La Spaziale machine with six group heads. I thought, why on earth would you need six? Having three people on a machine seems like it a big confusing stressful mess. Or, more eloquently, a cluster-cuss. When I worked on Lineas in the past, there was usually two of us on the machine at the same time, one steaming and the other pulling shots. But even in that situation, two heads and two steam wands would have been plenty. 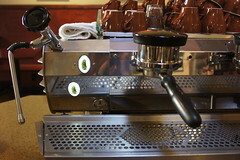 The other Lulus used to have a 4 group head Linea. The lone barista almost always left the last group head (which was horribly placed after so much use, the handles started blocking one another) completely untouched throughout the day. What a waste. So then why are our top of the line machines still utilizing three group heads? 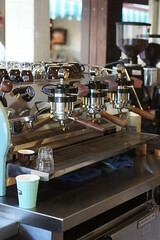 Back in March, I went down to Intelligentcia in Venice was really impressed by their set up. 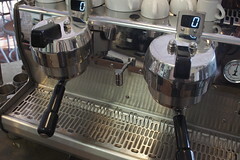 The barista stations really succeeded in two ways; it allowed for intimate interaction between the barista and customer and the small but fully equipped work space utilized two group head Synesso Cyncras that made the process efficient, streamlined, attractive, and effective. This seemed to be the best way of utilizing equipment to the fullest while maintaining (and exceeding) high standards. Companion’s new Cyncra definitely feels like the best use of space on their counter and the best way to give their baristas a high end machine at a valued price. Perhaps I have digressed. I am likely traveling into waters that I am really not qualified to discuss at any length. These were just my pondering while standing over my Mistral today and while watching the other baristas working as individuals at their bars, wondering why we had three group heads. When I open my store, I think I will stick with two. The ideal shot pulls around 25-27 seconds. The physical limits of a human being to tamp three “proper shots” would likely not make the 25 second time limit. Our goal is to have our milk and shots finish at the same time. Busily preparing a second (not even a third) shot would likely detract from this precision process. 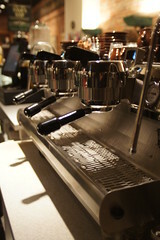 Most shops seem to champion the idea of one barista to a machine, even during high traffic hours. Plus, big machines look ridiculous. People mostly buy 3 group machines because their cost is almost negligible compared to a 2 group machine. It’s nice to have an extra group head incase something is going wrong and allows for a larger work space on bar. You know better than I lol. I like the feeling of smaller machines but thats just a personal preference. Yeah, definitely nice to have a back up and I can attest to that. Cost wise though I know my friends got their two group cyncra for about $10k and I dunno about the three. But thanks for your comment! Also, I think it depends on the model. For instance, the difference between a La Mistral with 2 groups vs. a 3 is about $4-5K and as a whole it is not a huge price jump but it can get pricey.